A little more than five years ago I was elbow deep in emails. The Star Wars articles that I'd written were getting a lot of hits and getting mentioned on websites and in magazines (seriously). I was getting hundreds and hundreds of emails about the articles. A lot were complimentary and many were not. Those times were extremely important, particularly to this internet community. A lot of the most active members on this community were form that group of people who'd emailed me. Members such as barend, civilian_number_two, Despondent and Supes are just some of the members who chose to join this community and are still active here. When, eventually, I became too overwhelmed to respond to all the emails I removed my email link from the articles, emailed all the people who had emailed me before, and set up shop here to provide an open forum to everyone who had similar views to mine. 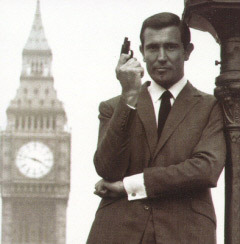 Around this time in the past I received an email from a man named Joachim Horsley who told me that he'd been referred to the site by a friend and the he loved the articles. He sent me a link to a song that he'd written about Lando Calrissian. I was extremely skeptical. I had received a lot of links to other people's material including songs and video and not all of it was that great. It was with a little reluctance that I listened to Jo's song and it was a mind-blowing experience. Jo's band, LittleHorse, had released the album Perils and Thrills in 2000 and it featured the song Lando Explains. You can (and should) listen to Lando Explains on LittleHorse's MySpace page. You'll have to scroll down to the last song on their playlist to hear it. The song is incredible. It doesn't take the common approach of trying (and failing) to be funny. It doesn't mention Lando being a pimp or drinking Colt 45. It doesn't throw in stupid wookie growl sound effects for cheap laughs. Instead the song tells the story of The Empire Srikes Back from Lando Calrissian's point of view. It tells about the dilemma Lando finds himself in on Bespin upon Han Solo's arrival and how Lando tries to do the right thing for everyone involved but has to make some difficult decisions. Soon after hearing Lando Explains, LittleHorse released their first full length album The Mission Before Us. I ordered it straight away and have been a huge fan ever since. The album is great and features a tribute song in a similar vein to Lando Explains about Sherlock Holmes. It is arguably the best song about Sherlock Holmes that has ever been written, though it's only competition is against other songs by LittleHorse. Jo and I kept in touch over the past five or so years, emailing each other on and off. Apparently he's been a regular reader of the site though he's never officially registered. We even both moved to New York City around the same time and live relatively close to each other. So for a while now we've been making plans to meet up and grab some dinner. This past Wednesday we finally met up on the Upper West Side for sushi and had a great time talking primarily about music; Star Wars and the upcoming Star Wars TV series; LittleHorse and the new CD that Jo and his brother Erich just released; and wedding planning. I had thrown around the idea of doing an interview with Jo for the website but we never really got around to that (maybe some day soon). But I would really like to take this time to plug his new album because I'm passionate about it and I'd like to get more people to hear their stuff. 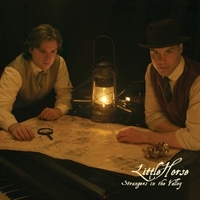 LittleHorse's new album, Strangers in the Valley is available right now on CD Baby and iTunes. They are having a Strangers in the ValleyCD Release Party on October 12, 2007 at the Symphony Space in Manhattan. If you live in or near New York, you should come check it out. Most of the musicians from the album will be there for a two hour show. Please go watch the video. As of posting this it has 803 views and comes up on page twenty-two for a search on "Flight of the Bumblebee" on YouTube. More people need to watch this and see how cool LittleHorse is. Watch it and rate it and get it out there! Anyway, I'm devoting myself to promoting LittleHorse for the next two weeks until the concert. I'm loving their new album and look forward to a more in depth review/interview sometime down the road. For now enjoy the links and the music, watch the video and if you're in New York, come check out the show! Well done Chef. I think more people should promote offbrand stuff that they like; it's really the only way to get it noticed amid the big corporate promotion machinery. I for my part will use your thread to say that INTELLIGENCE Season Two is starting up October 1st on the CBC. Everyone should be watching that show about the often overlapping worlds of organized crime and the intelligence community that tries to infiltrate it. haha, that video made me really happy. I will definitely check them out. That was quite good. Very professional. How on earth does a two-piano band go on tour, though? Well, they don't really tour, but they do play some shows. Largely they do not use actual grand pianos, but rather electric pianos, etc. Here's two more videos I just uploaded to YouTube. They're also available on the LittleHorse MySpace page but I just didnt' have as much luck linking directly to those. Aplogies to LittleHorse for re-uploading to YouTube. A longer promotional video featuring clips from Running Just Ahead of the Devil, Back in America, and Lando Explains. These guys are a really rockin' and a whole lot of fun. I might buy their album when I get some extra spending money. The concert was tonight and it was AMAZING! There were people there recording video. I hope I get a chance to see that some day!